Home / News / This week at IHC – 3-06-2018 – Martyrdom of Imam Ali AS & Aamal of Laylatul Qadr. This week at IHC – 3-06-2018 – Martyrdom of Imam Ali AS & Aamal of Laylatul Qadr. Please see below the programs from the 19th Night of Ramadhan – the 23rd Night of Ramadhan. On Sunday 3rd June, we will be commemorating the attack on our 1st Imam Ali A.S. The program will begin with Maghrib prayers at 5.16pm, followed by Iftar and Du’as. Majlis will begin at 7.00 pm and will be recited by Maulana Kamran Jafri and Br. Hasan Reda in English. The Aamal program will begin after the majlis and matam. 5.16PM Prayer/ IFTAR –Birthday Celebration of Imam Hasan A.S.
7.00 PM AAMAL 19th Night of Ramadhan -Majlis- Commemoration of the attack on our 1st Imam Ali A.S. There will be no classes on Saturday 16th June if Eid is confirmed on the day. 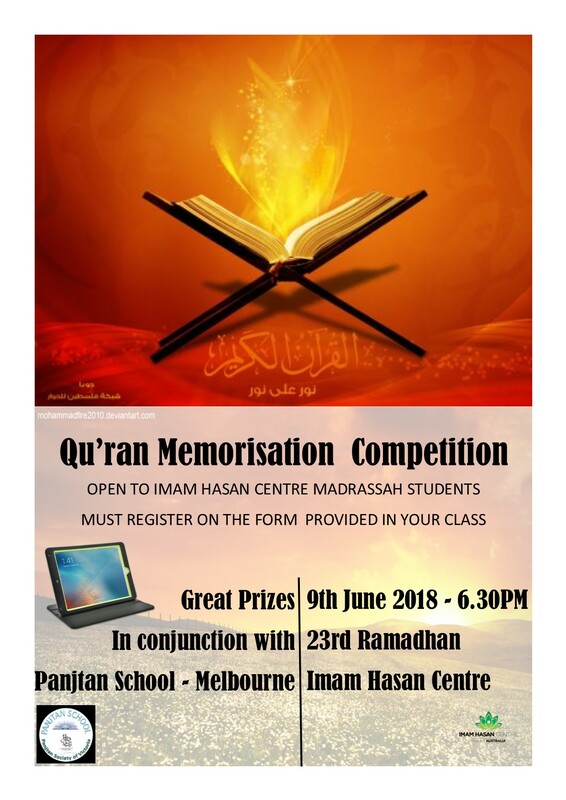 Imam Hasan School is running a Hifz competition during Ramadhan, parallel to the Panjatan centre in Melbourne. IHS encourages all its students to participate in the competition, as Ramadhan is the month of becoming closer to the Quran. 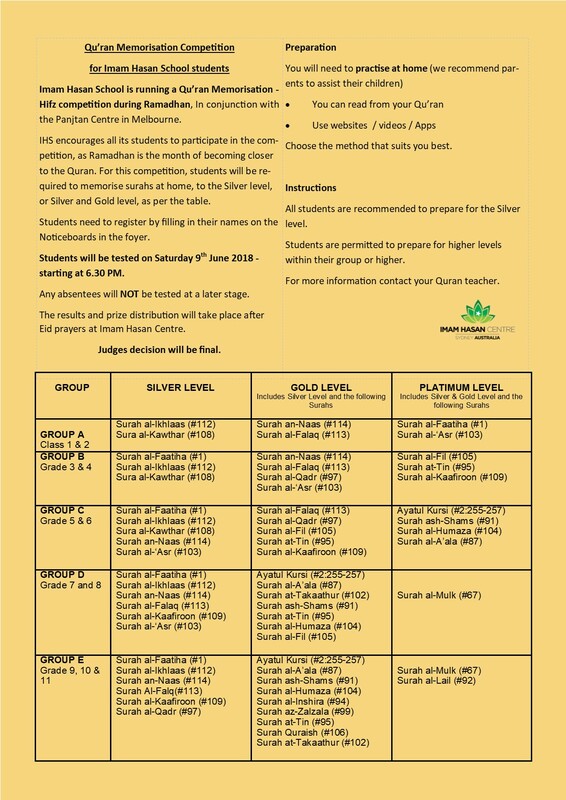 For this competition, students will be required to memorise surahs at home, to the Silver level, or Silver and Gold level, as per the table. Students need to register by filling in their names on the Noticeboards in the foyer. Students will be tested on Saturday 9th June during class time ONLY. Any absentees will NOT be tested at a later stage. The results and prize distribution will take place after Eid Salah at Imam Hasan Centre.